The three most important things one should know about JCI can be explained by its abbreviation. The J stands for Junior which implies that (We/JCI) is revolving around young people. Ages from 18 to 40. (C)hamber represents the unity which is a very important thing for (JCI/Us) because we are aware of the importance of networking. The last but not least is the Internationality of the JCI organization. Meaning? Presence in over 100 world countries with 4 official languages. The task was clear - creating a functioning and modern microsite. Bearing the youth factor in mind, we wanted to create a smoothly flowing page that had a mission to invite interested parties to the JCI European presidents meeting. 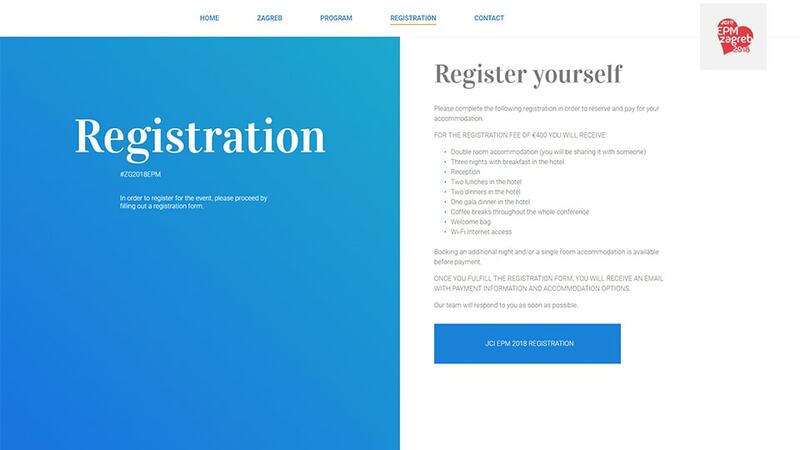 The main goal of the page was to offer a clear registration form while explaining the value of the meeting for its participants. 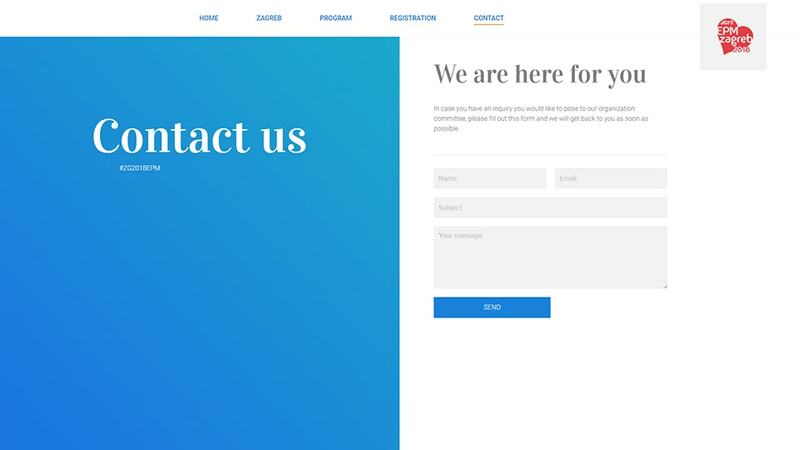 Besides all of this, the page was clothed in Zagreb's attire and is offering some interesting facts about Zagreb - the meeting's venue and a contact form stating that "We are here for you". 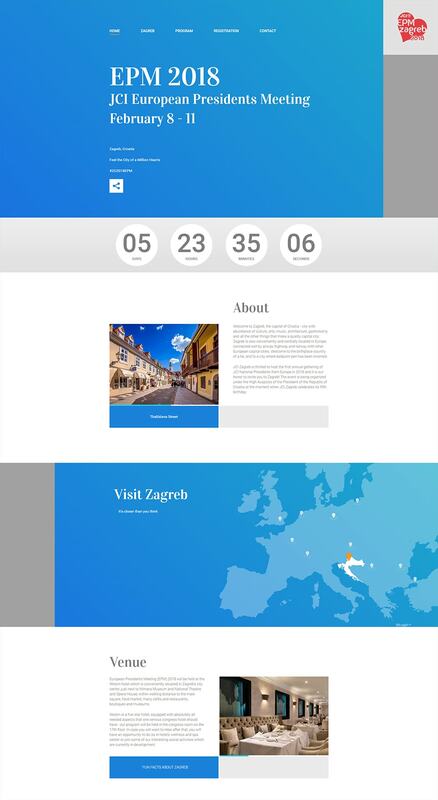 Our work resulted in making the landing page that reflected the image of Zagreb. 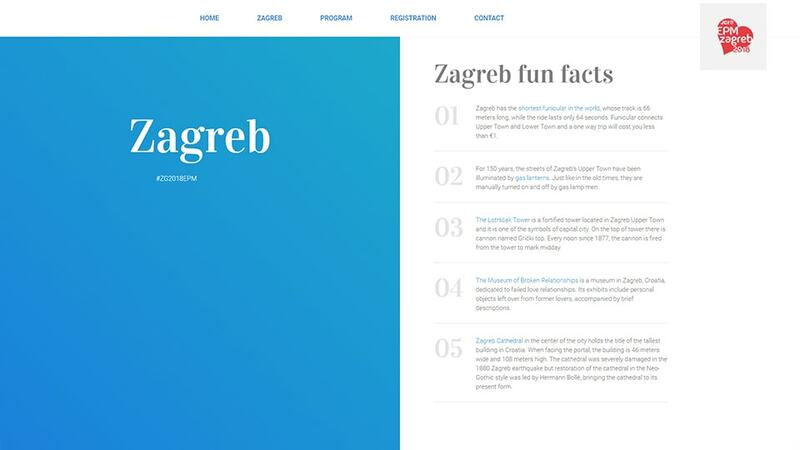 If we concur about the fact that the white "blank space" is a readers friend due to adding a significant amount of visibility, the choice of page colors was clear - white and blue, which is the official color of Zagreb, as well as of JCI. We were well aware of various ways of approaching the site, so we made sure the page is working an all kinds of platforms. Desktop and mobile ones. "We are organising Conference for European Presidents, which is one of the most important International events, and we could not choose a better partner for our online presence than a profesional and positive team from Kontra agency. They showed us high work ethic required to make the job done in deadlines. Dedicated to open communication they made every task in the project fluent and effective." 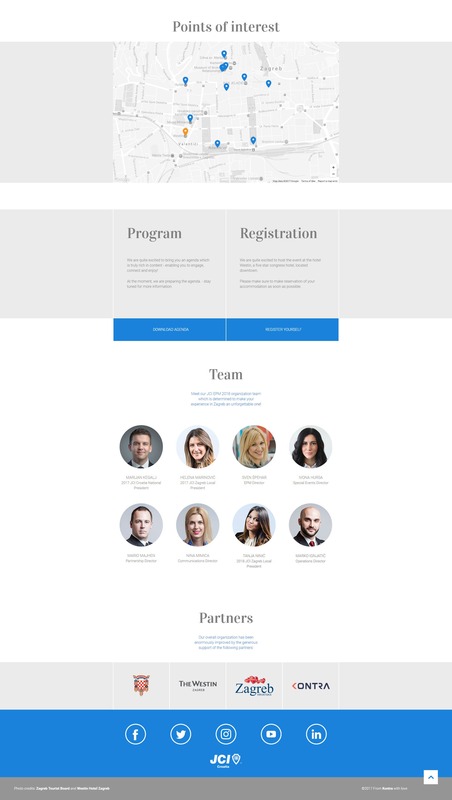 "For our team it was of outmost importance to create a web platform which would be a) appealing and inviting and b) concise and clear in its call for action (event registration). I am very satisfied and thankful that Kontra team managed to develop a website which fulfils all of our initial brief requirements and I am glad to recommend them as a team with whom project work was at the same time professional and enjoyable."